A new gallery of interactive graphics at Moyhu. There was an old page, linked to right, on interactive graphics at Moyhu. I have replaced it with a new gallery, which is much more comprehensive. Maybe too comprehensive - I have tried to include every instance to end 2017. It is a tableau of images, and I have placed at the top what I think is a representative selection. These are marked with red borders. Each cell has a passive image, a date, a link which will take you to the original post or page containing the graphic, and a button imploring you to Try it!. This takes you to a rearranged version of the original post with the graphic at the head; it is an active version of what you see in the image. The radio buttons on the left allow you to choose categories, generally based on the technology used. They are explained below the tableau, and I will expand on them here. Much of my experimenting with graphics has been motivated by a wish to present data plotted on a sphere, to avoid projection distortion. JS makes it possible to do this and allow the user to view the sphere from various directions. I have recently revamped the Moyhu topic index, and some of the toipics give a more comprehensive list of links. A common use of JS and buttons was simply to compress information. A lot of images could be accessed at one location in the page, with a choosing mechanism. Alternatively a huge number of links can be sorted into manageable pages with button clicks. That set me up for the first presentation of a globe plot, as here. In R I made 2D projections from a number of viewpoints of a shaded plot of some variable, usually temperature. The viewpoints were usually from either the 8 corners of a cube containing the sphere, or the 6 face centres. There was a panel of squares you could click to switch views. A lot of my JS graphics involves locating a click point and responding in some way. Dragging is a variant of this. This was rather a dead end, but I did quite a lot of things. KML is a control language for Google Earth. Here is a typical application. I haven't shown the graphics here because, well, they aren't really mine. GE is good for detailed location, which is relevant to individual stations, but not to temperature plots etc. I found that the control capabilities, based on folders were rather limited, so I switched to Google Maps, which offers JS control. The general idea and working environment is described here. GM provides an app which allows you to embed a GM in your page, but gives ample facilities to control it with JS. Again the main use is for showing land stations, where the lat/lon are fairly precisely known. I typically select subsets of the stations colored according to some criterion. Clicking on them brings up information including the name and often links and history. The selection table is on the right, and can allow quite complex logic. Recent cases show the total in each color. There is, for example, a maintained page which is described here. This is just a subset of JS-active graphics, in which a spaghetti plot is shown, with a large range of strands, usually proxies. More use of JS is made in that when a strand is marked, a table of information os shown, and also a marker shows where it is on a map. A typical example is here. This is another JS subset. A colorful triangle (prepared in R)is shown in which each dot represents the trend over some period of months. There is a coupled time series graph on the right, with two markers representing beginning and end of trend. You can choose a period either by clicking on the triangle or by moving the markers directly. For each chosen period, numerical data is displayed. Buttons allow you to choose the overall display period, the dataset (from one of many), and possibly a different kind of display which says something about the significance or confidence intervals. There is a maintained page here. HTML 5, when it came out, included a lot of new elements, but the one particularly useful to me was the canvas element. All the graphics described so far had to be pre-drawn using R and supplied as images. With the canvas, we can draw from numerical data, in response to user input. Further, there is a clunky but not bad capability for shading triangles in response to vertex values. One liberation is that graphs don't any longer have to have a fixed range of x or y. The user can zoom or extend, if the numerical information is there. My first big use of this was in the climate plotter. This is still kept as a page, although the information update has been spotty. You can choose from a large number of annual sets of climate data. Combinations can be displayed and regressions (including polynomial) performed. Various kinds of arithmetic can be done, But most importantly, the axes are under user control. You can translate curves independently, stretch in the x or y directions (with axes adapting). A similar application is to superimposing on an image. I rather frequently review the progress of Hansen's 1988 predictions, eg here in 2016. This makes a canvas image from his paper, and the user can choose various datasets to superimpose, and even vary offsets if desired. Another liberation was in viewing Earth plots. No longer need there be fixed views pre-calculated. The canvas can show shading in response to arbitrary control (there is maths involved). An early version is here. The use of shading improved over time. This is an extension, using HTML 5, of plotting with variable axes. You can translate just by dragging, or by dragging just behinds each axis, you can shrink or expand it. And there can be the usual selection facilities etc. I maintain such a graph for surface indices in the latest data page. Most recent graphics has been done with WebGL, the origins of which are described above. WebGL is the staple of gaming, and so ample resources are provided. For fast-moving graphics on screen, it provides access to the GPU, for highly parallel operation. It is fully 3D, so keeps track of what is obscuring what. The shading is excellent. It has elaborate capabilities for lighting and perspective, but I don't use those much. And of course it is under full JS and mouse control. In my applications there is a fixed centre point about which everything can be revolved, and a fixed viewpoint at infinity. A great thing about WebGL is that it deals in objects. In HTML5, you can't unravel a 2D canvas, and it is hard to selectively erase. But in WebGL you can just ask for an object to disappear, or move it, and you see what is underneath. My first effort is here. But it got better. One that is still one of my favourites is the maintained high resolution SST page. At max resolution of 1/4°, that is a lot of triangles (2073600). But WebGL handles it fairly well, and it really can tell you more if you zoom. The app draws together a lot of technology, as interactive downloads are essential, and since that are about 25 years of data, a lot of it daily, just organising this is a stretch. Like all maintained pages, it downloads data and processes (in R) every night. But the recent outpouring of WebGL graphics which dominates the gallery is due to the Moyhu WebGL facility. This hides all the parallel programming etc and just allows as input as numeric data. Usually a vector of nodes, linkages (for triangles etc) and values which will become shading. Mass production. A non-spherical example is the Lorenz butterfly.. This isn't a single technology; in fact I started out with animated GIFs. I tend to use it now where video compression is used, as with MPEG. I typically use FFmpeg with R to string together sequences of PNG or JPEG images. The classic example is a maintained page which is an offshoot of the HiRes SST page. It shows daily or 4-day sequences for regions like the ENSO Pacific plumes or the poles (where it is good for tracking sea ice). Another interesting experiment was the 2012 hurricane season, where I show the hurricanes moving against a SST background. In many cases it clearly shows the tracks of cooling. An aspiration is to provide a 3D movie, so you can rotate a world as it goes through a temperature or whatever sequence. The problem is that you lose video compression, so it is hard to maintain speed. Here I went back to the JS globe idea above, using stored projections of 6-hour relative humidity plots. It's interesting, but hard work. Another kind of animation is just zipping through WebGL plots. It's fast enough. Here is a movie display of the various spherical harmonics which I use a lot for Fourier-like representation on the sphere, with various controls. Fun version here. Satellite temperatures are adjusted much more than surface. One might ask, Why do the satellite data have to be adjusted at all? If we had satellite instruments that (1) had rock-stable calibration, (2) lasted for many decades without any channel failures, and (3) were carried on satellites whose orbits did not change over time, then the satellite data could be processed without adjustment. But none of these things are true. So instead of continually making small adjustments, as in the surface dataset, they produce new versions in which these decisions are revisited and often radically revised. The changes are much larger in overall effect than the changes to individual surface station averages. "Of course, everyone has their opinions regarding how good the thermometer temperature trends are, with periodic adjustments that almost always make the present warmer or the past colder." So I compared the change in TLT (lower troposphere) going from V5.6 to 6.0, to the cumulative effect of changes in GISS from archived time series of 2005 and 2011, with the then current 2015 GISS. GISS was far more stable than UAH, even though the period of changes was much longer. "But, until the discrepancy [in trend with UAH higher]] is resolved to everyone’s satisfaction, those of you who REALLY REALLY need the global temperature record to show as little warming as possible might want to consider jumping ship, and switch from the UAH to RSS dataset." They needed little persuasion. Lord Monckton wrote a monthly series at WUWT about the length of the "Pause", which he defined as the maximal period of zero gradient of RSS TLT, starting about 1997. He scorned UAH then, as it was similar to the surface data. But RSS V4 turned that around too, showing much greater trends historically, and severely damaging the "Pause". I commented on some of this here, before any of the new versions. Lord Monckton did not like it. His tamper tantrum is here. Any change which increases the trend is "tampering". Why going from V3.3 to V4 is tampering, but going from 3.2 to 3.3 or the earlier steps is not, was never explained. Anyway, I thought it would be worth updating my graphs of Dec 2015 to include the changes to RSS. In fact, the two indices neatly changes places, so that RSS V4 is close to UAH V5.6, and UAH V6 is close to RSS V3.3. So in both cases the change is large. An amusing sideshow of the more satisfactory UAH V6 is that surface datasets were being accused of fraud for differing from it - eg NOAA’s Fake SST’s Not Supported By Atmospheric Data. But the reviled discrepancies were not there with V5.6, which was far closer to the surface data than to V6. So was V5.6 also "fake"? Anyway, here are the plots. I'm using the same old versions of GISS as in the previous post and sourced there. They can be got at the Wayback Machine. I convert everything to the same anomaly base, which this time is 1979-2008. I chose that because there isn't quite a 30 year span common to GISS2005 and the sat sets, but this reduces the gap to three years. So I set the other sets to zero average on this span; then I make the GISS2005 match the rebased GISS_current on its range. This plot is good for a general appreciation of the deviations. The GISS variants bunch together, and the upper sat variants, UAH V5,6 and RSS V4.0, tend to follow them. The other pairing, RSS V3.3 and UAH V6, is the outlier, deviating rather markedly below from about 2008 onwards. Next I plot the difference from one version to the next - ie the "adjustment". In each case, it is new minus old. Again you can use the buttons to cycle through different colors. This shows most clearly what happened in the recent changes. The trend of UAH went way down, and the trend of RSS went way up. These changes dwarf the minor and fairly trend-free changes to GISS. Interestingly, especially for RSS, most of the change happens post-2000. Of course, GISS has more changes going further back. But satellites do not have an advantage there. They have no data at all. Each year now when results for the previous year are in, I post some graphs (2017 here), and invite discussion about the coming year, which can be maintained on that thread. Reader Uli follows the prospects for GISS; readers JCH and WHUT remind us about ocean periodicities, and there are many other interests. I don't have strong prognoses myself; I just expect it to get warmer, with variations. I think 2017 predictions worked out fairly well, mainly because the chief unexpected event, the strong warmth in Feb/March, came early. It created some possibility that 2017 might exceed 2016, but by August that was starting to look unlikely. That left the question of whether it would beat 2015, and that was close in most indices, with those that gave proper weighting to the polar temperatures putting 2017 ahead. 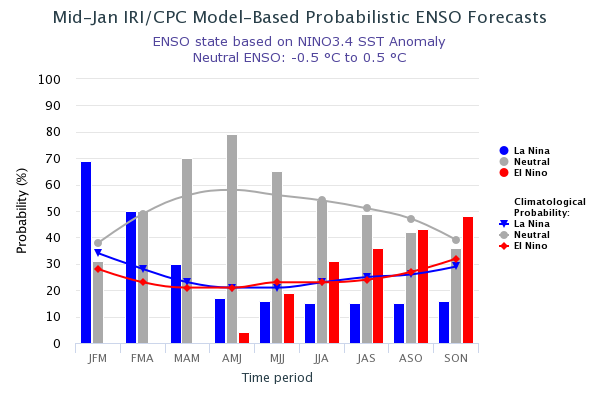 On the prospects for ENSO, Australia's BoM expects a weak La Niña in the short term. 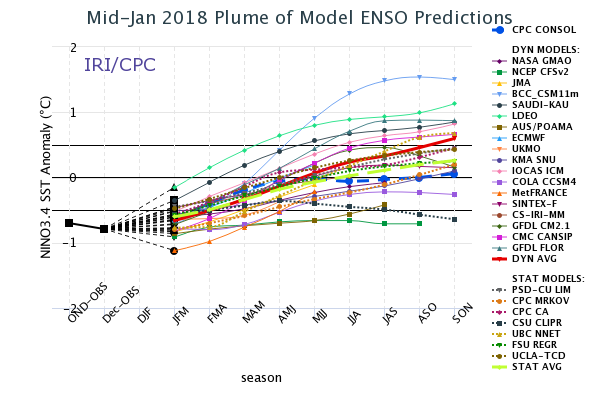 The NOAA has been silenced by the shutdown, but the IRI forecasts tend to see this going away fairly soon, with a fair chance of El Niño conditions later in the year. For the moment, January has already been through two peaks and two dips, but overall, not much different to the last nine months. So I'll leave the thread there open for comments through the year. Thanks, Uli and all. I'll add more as they arrive. You can find more information about the indices, with source links, here. The Glossary may help too. You can flick through the 7 images using the buttons below the plot. GISS and TempLS had 2017 in second place, as did RSS V4.0. HADCRUT, CRUTEM and NOAAlo put it behind 2015 in third place. UAH V6 had things in a very different order, with 1988 in second place, and 2017 a distant third. The grouping of the surface indices is commonly observed. TempLS mesh and GISS interpolate, giving more (and IMO cdue) weight to polar regions. NOAA and HADCRUT do so much less. So insofar as the warmth of 2017 was accentuated at the poles, the less interpolated indices tend to miss that. Here is the set of monthly averages for each of those indices, with as before the annual averages shown as horizontal lines in the appropriate color. Almost all months of 2017 were well above the 2014 average, even though 2014 was a record year in its time. GISS December global up 0.02°C; 2017 was second warmest. 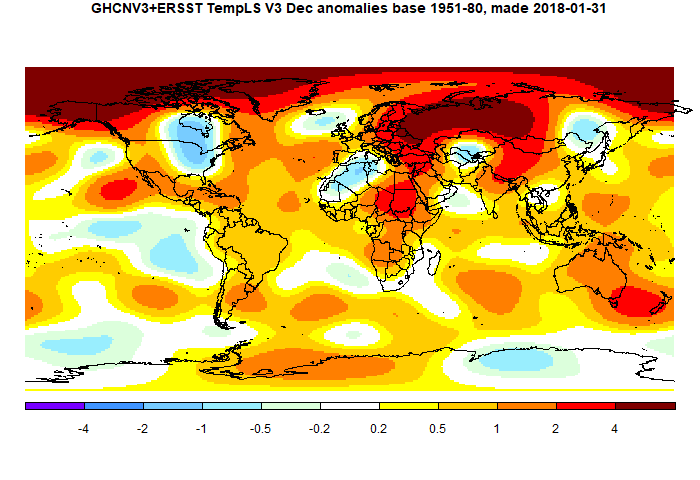 GISS warmed slightly, going from 0.87°C in November to 0.89°C in December (GISS report here). That is very similar to TempLS mesh; I originally reported no change, but later data pushed that up to a 0.04°C rise. For GISS, that makes 2017 the second warmest year in their record; behind 2016 but ahead of 2015. Their report, with the annual summary too, is here. I showed some aspects of 2017 annual in context here, and I'll do that for GISS and other indices in an upcoming post. The overall pattern was similar to that in TempLS. Cold in east N America and Mediterranean and far East Siberia. Very warm in most of Russia, and in the Arctic. A cool La Nina-ish plume, but warm in the Tasman sea. Review of 2017, heat records, and recent warm years. I've also marked each year's average in the appropriate colour. 2017 is almost a mirror image of 2015, and the main contribution to its warmth came from the first three months, a somewhat separate peak from the El Niño. But what is clear is that the apparent level of later 2016 and 2017 is a good deal higher than 2014, a record year in its day. Even the coolest month of 2016/7 (June 17) was at about the 2014 average. In my previous post, I reported December 2017 as virtually unchanged from November. Further data has made it a little warmer. In other news, the Australia BoM 2017 climate statement is out, and here 2017 was the third warmest year, after 2013 and 2005. December global surface temperature unchanged; 2017 was second warmest year. 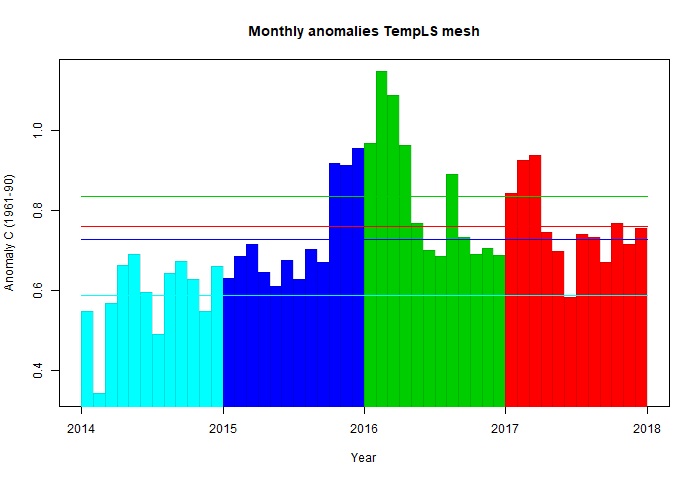 TempLS mesh anomaly (1961-90 base) was virtually unchanged, from 0.716°C in November to 0.721°C in December. This compares with the rise of 0.075°C in the NCEP/NCAR index, and a similar rise (0.05) in the UAH LT satellite index. 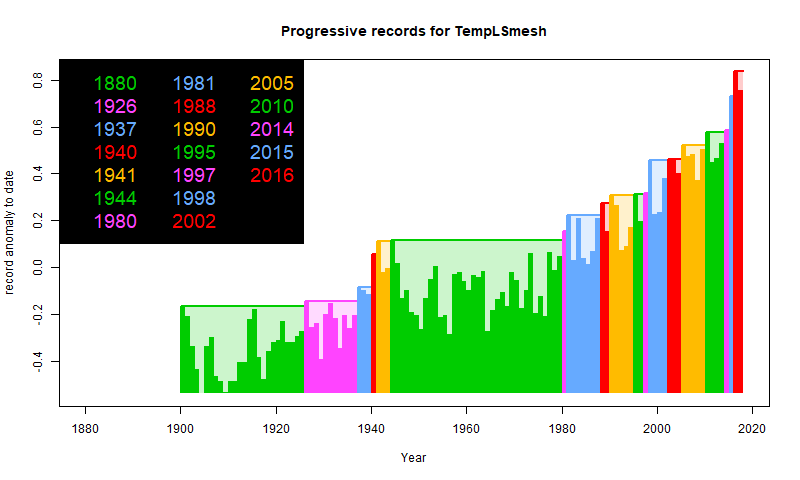 The TempLS average for 2017 was thus 0.757°C, which puts it behind 2016 (0.836°C), and ahead of 2015 (0.729°C), and so was the second warmest year in the record. I expect this will be a common finding, although 2015 is close. I'll post a graph showing the history of records. The breakdown is interesting. The main cooling effect came from SST, well down on November. The balancing rises came from the Arctic and Siberia. Since TempLS, like GISS, is sensitive to Arctic temperature, indices like NOAA/HADCRUT may well show a fall. Otherwise the map shows those effects, along with much-discussed cold around the Great Lakes region and also W Sahara. In the Moyhu NCEP/NCAR index, the monthly reanalysis anomaly average rose from 0.253°C in November to 0.328°C in December, 2017, making it a mid-range month for 2017. The temperature did not oscillate as much as in some recent months. The main cool spots were Canada and E Siberia, NW Africa (Algeria) and Antarctica. East Europe and NW Russia were warm, and also Alaska and a band through the Rockies, S Calif. There was a notable warm spot in the seas around New Zealand. The annual averfage for 2017 was 0.376°C. This puts it behind 2016 (0.531) but ahead of 2015 (0.330) and 2014 (0.190).